Welcome to the collaborative starting page for this Sustainable Development Goal. Want to help editing/writing/further developing this page? At the bottom, hit the "sign in" button. Photo: A coin for GlobalGoal13 CLIMATE ACTION by a cooperative that started printing its own money in the form of #GlobalGoal Coins. It realized that its members had an easy time solving humanities most challenging problems, however this was not valued and obtaining fossil fuel currencies like $, £, €, ¥, even a local bank account was near to impossible due to national corruption. Their conclusion was that something was seriously wrong in this monetary system. Therefore they started printing their own money. For every unit of a #GlobalGoal that has been solved, a coin is produced. Only with these coins goods and services can be bought in the cooperative. Their reasoning is that if you are a sustainable organisation of person, you also have these kind of coins and you can buy their goods or services too. If not, you'll have to exchange your currency with theirs. A coin for GlobalGoal13 CLIMATE ACTION follows the Emission Trading System for CO2e certificates. 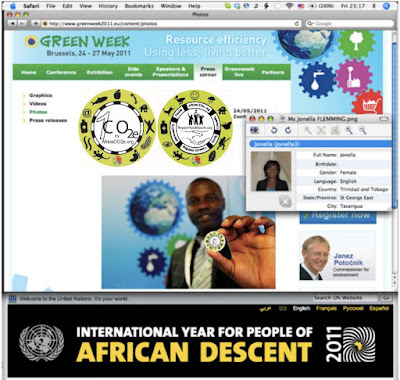 The cooperative prints 1 CO2e coin or #GlobalGoal13 coin when 1 ton of CO2e has been removed by e.g. members planting trees. The rules for the calculations are laid out in the UNFCCC / CDM manual. The ambition of the cooperative is to combine this practise with a Multi-Level-Marketing system to have it spread rapidly as a local currency to foster local currency. 3 Where should the money come from to pay for all these GlobalGoals? Where should the money come from to pay for all these GlobalGoals? #GG 17.3 Mobilize additional financial resources for developing countries from multiple sources / Where should the money come from to pay for all these GlobalGoals? As Environmental Judge at the Environmental Court of the Brussel Capital Region and very active in the 17#GlobalGoals, I was invited to give and just finished giving feedback to the UN "GLOBAL PACT FOR THE ENVIRONMENT" which will form the basis for world wide Environmental Enforceable Legislation and be an extension of the Sustainable Development Goals / 17#GlobalGoals.